One of the many things from the Chattanooga shootings to be outraged over is that, because the recruitment center was a gun-free zone, our MARINES were not able to defend themselves. As a result, citizens from Texas, Alabama, and Tennessee are taking matters into their own hands. 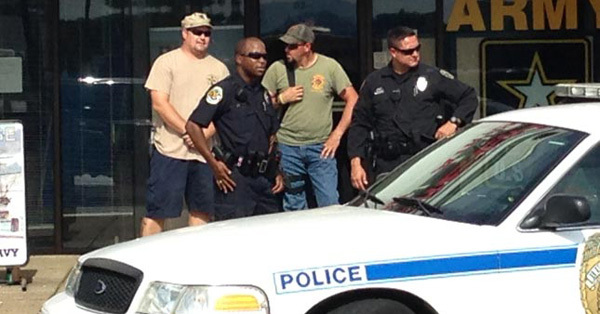 Outside a recruiting facility in Murfreesboro, TN armed citizens have been standing guard all day in the sweltering heat and say they will not leave while the recruiting facility is open until the Gun Free Zone sign is taken down. Supporters have been dropping off food, water and other supplies all day to the armed citizens. “No one else is protecting them,” says Brandon Curran one of the armed men who has been standing on guard. Also, Governors in Texas, Indiana, Oklahoma, and Louisiana have all ordered their state Guardsmen to be armed. In Florida, the Governor moved recruiters from store fronts to armories.